Explanation: The awesomeness in this image comes in layers. The closest layer, in the foreground, contains the Peak Terskol Observatory located in the northern Caucasus Mountains of Russia. The white dome over the 2-metre telescope is clearly visible. The observatory is located on a shoulder of Mt. Elbrus, the highest mountain in Europe, with other peaks visible in a nearby background layer. Clouds are visible both in front of and behind the mountain peaks. 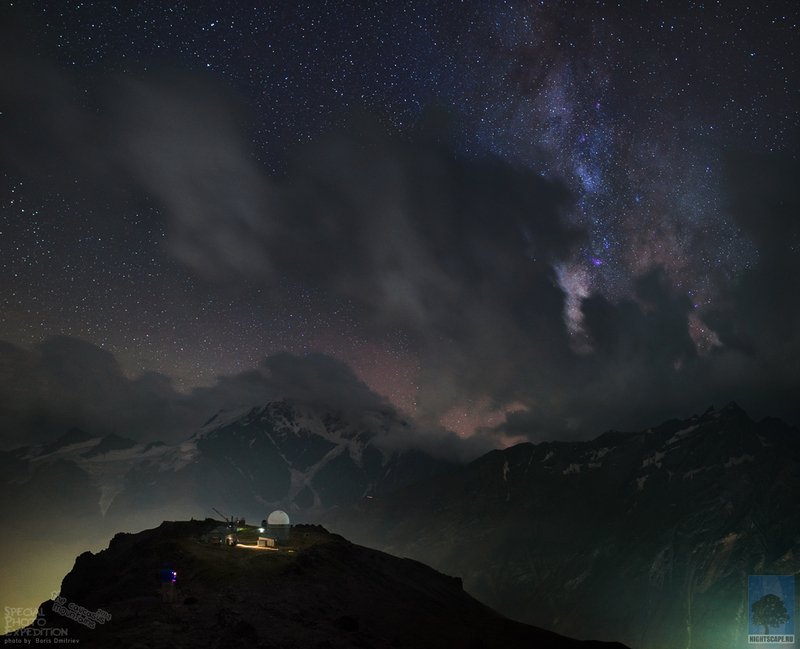 The featured three-image composite panorama was taken in 2014 August. Far in the distance is the most distant layer: the stars and nebulae of the night sky, with the central band of the Milky Way rising on the image right.